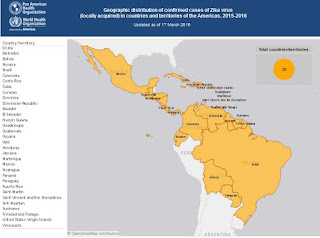 With the addition of Cuba to the growing list of countries where the Zika virus is now circulating, the virus has - in a matter of only a few months - swept across pretty much the whole Caribbean basin, and has conquered the bulk of South America. Local vector transmission has yet to be reported in the Continental United States, but with the approaching end of winter, few expect we'll go through the summer completely unscathed. The southern tier of states (Particularly Florida & Texas) are considered most at risk, although several recent forecasts suggest small localized outbreaks could occur as far north as New York City (see Lancet: Global Risk Of Zika Spread Dependent Upon Competent Vectors). Yesterday the CDC officially added Cuba to the list of countries where the virus is actively transmitting, and offered the following guidance. CDC is working with other public health officials to monitor for ongoing Zika virus‎ transmission. Today, CDC posted a Zika virus travel notice for Cuba. 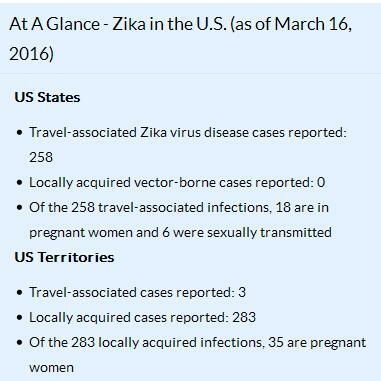 CDC has issued travel notices (level 2, "practice enhanced precautions") for people traveling to destinations with Zika. 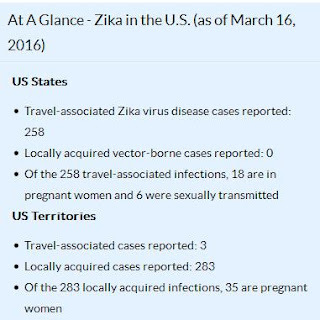 For a full list of affected countries/regions, visit http://wwwnc.cdc.gov/travel/page/zika-travel-information. As more information becomes available, CDC travel notices will be updated. Travelers to areas with cases of Zika virus infection are at risk of being infected with the Zika virus. Mosquitoes that spread Zika are aggressive daytime biters. They also bite at night. There is no vaccine or medicine for Zika virus. The best way to avoid Zika virus infection is to prevent mosquito bites. Some people who are infected do not have any symptoms. People who do have symptoms have reported fever, rash, joint pain, and red eyes. The sickness is usually mild with symptoms lasting from several days to a week. 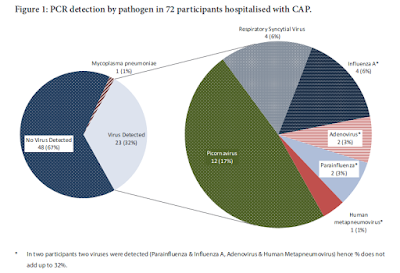 Severe disease requiring hospitalization is uncommon and the number of deaths is low. Travelers to areas with Zika should monitor for symptoms or sickness upon return. If they become sick, they should tell their healthcare professional when and where they have traveled.